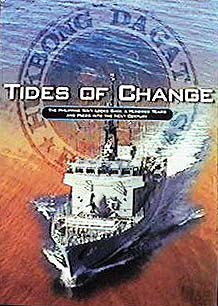 The Philippine Navy launched its coffee table book entitled "Tides of Change" on 2l May 1998, at the Philippine Navy Headquarters on Roxas Boulevard. It is the first full color history book that has been published on the Navy. The book "Tides of Change" contains numerous photographs that show the many facets of the Navy and its personnel, while chronicling its origins as the Katipunan's seaborne force, its resurgence as the Off-Shore Patrol of the Philippine Commonwealth and the Philippine Naval Patrol of an independent Philippines after WW2. The book focuses on the need to recognize that being an archipelagic country, the seas surrounding the Philippines are an important resource that needs be properly managed and protected. And only in the last decade has this begun to be recognized by the Filipino People. As it seeks to increase this awareness of our seas..."The book is designed precisely to stimulate constructive debate on the need for a strong Navy that can enhance the Philippines' position in the emerging global geo-political and economic environment." In Chapter 3, titled "the Continuing Quest for Relevance", the course of the Navy is plotted out for the coming years on how it will achieve its goal of modernization and service to the country. A Video Tape and Compact Disc (CD) also titled "Tides of Change" are also available. One scene on the video shows General Emilio Aguinaldo leading an Amphibious Assault in Cavite Province on May 26, 1898. The actor portraying Aguinaldo is his great-grandson, Lt. Joseph Emilio Aguinaldo Abaya of the Philippine Navy, a graduate of the United States Naval Academy in 1988. Visit the Philippine Marines. Use your browsers "Back" button to return.